A BRAND new Sushi joint, a Portuguese cafe and two new wine bars, it is fair to say nothing stands still in the Sierra Nevada. 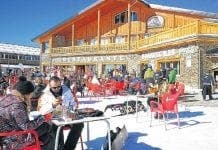 The real plaudits however must go to Tito Tapas, one of the most stylish new openings on the slopes for years. Contemporary and cutting edge, the beautiful wine and tapas bar has been carefully created by the team behind Tito Luigi in the same block. Hundreds of thousands of euros have been spent on importing German wood, an incredible sound system and a chef from Menorca, who really knows his onions. It is an excellent place to start the evening with cocktails from 4pm, while it has a decent wine list and new tapas being created by the week. Another fantastic new opening is el Club de la Montana by the guys behind Campo Base. This fun, original spot, just up from Tito Tapas, has its very own eclectic style, focusing on Rock and Blues music and with a series of original album covers on the walls. The menu is broken into sections, including ‘finger food’, ‘mountain Tex Mex’ and ‘Tortillas’ club’ and the tacos with oxtail and an allioli of truffle was the sure-fire winner. In the very same block it gets even more exciting with the opening of a new Sushi joint Jinsei. Set up with help from a chef trained at Michelin-starred Kabuki in Madrid, this amazing addition is bound to win plaudits and gain a strong following, particularly thanks to its great-value €14 five course lunch, which comes with sushi, makis and gyozas, not to mention a delicious spinach soup to start. Another great tapas bar, with a real slant on top quality meats, is La Carreta. It has a superb selection of hams and chorizos and its owner Paco is a real whizz on the grill, and a jolly chap to boot. Next door, you will find a little slice of Sierra Nevada history. On the walls of restaurant Tito Luigi lies the evidence that he has provided good food and ambience for the last 26 years. Alongside photos of the king with owners Javier and Luis are snaps of politicians, flamenco stars and bullfighters who have all come up to enjoy his unique brand of hostelry. As well as organising parties in his ‘secret’ cave at the back, diners are treated to a great range of pizzas, salads and pasta dishes in his wooden beam restaurant. My pick: most definitely the spaghetti with salmon and caviar. Another real institution is La Lonja, which is the best place, by far, to eat seafood in the mountains. Buzzing at lunchtimes, the selection of marisco is impressive and there are always fresh lobsters waiting to be cooked. On the slopes for three decades, boss Antonio began life as a waiter in Granada, but now counts the King as a four-times visitor. He has another restaurant in Sanlucar de Barrameda and unsurprisingly stocks its famous langoustines, as well as knocking up a fine tuna tartare and some great shrimp frittatas. Next door, try not to miss Bodega Casablanca, run by Jose Carlos Villanueva, who grew up on the slopes, with his father opening one of the first hostals in the 1960s. He, of course, knows a fair bit about catering, and the bar has a great range of photos and memorabilia and is a great place for tapas or simply to hang out. His chef Mari Fe, from Pais Vasco, knows a bit about food too and you will love the prawns wrapped in potato with a soya mayonnaise, as well as lovely lamb chips with whisker -thin wild asparagus. Without a doubt, the most consistent place to eat in the Sierra Nevada is the brilliant Italian Ci vediamo, where chef/owner Stevie Silva produces a great Michelin-starred range of food. Silva, a professional snowboarder, is a massive meat fan, but also has a great range of light bites, a splendid pizza oven and some chestnuts such as a superb duck roll with ginger, guacamole, tuna and soy sauce. There are fabulous mini ‘gambas pil pil’ hamburgers and a lot of the classics such as raclette and provolone with tomato. That said the pesto pizza takes some beating and the wine list has a superb and good value range. For a great place to eat overlooking the slopes make your way to Tia Maria, which has a good mix of dishes and is a great for breakfast. Another sister restaurant of Tito Luigi, it is also very much an institution – open for 17 years – and with a decent selection of Tex Mex dishes including guacamole, quesadillas and ribs. Last, but definitely not least, if you want to enjoy the best terrace in the Sierra ensure to get a table at La Visera. This wonderful spot has been in operation for 20 years, run by friendly Jero, and has a great range of home cooked dishes, including a fabulous chicken fajita, with melted cheese, curry sauce and veg. And the cheesecake pudding wasn’t bad either. Finally, for coffee, Vertical is hard to be beaten and also has a great range of snacks and light bites, including hot dogs for the British clientele. 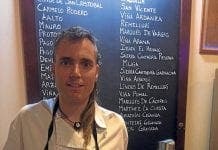 I couldnt agree more, Tito Tapas and Ci Vediamo are the best places right now in Sierra Nevada!